When Reive attacks, deal 2 damage to your opponent, then increase the damage dealt by 2. 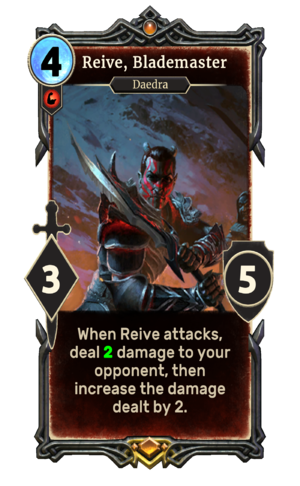 Reive, Blademaster is a unique legendary Strength creature card. It is part of the Core Set. "Let me kill for you." "They shall writhe in agony!" Damage dealt with Reive's ability will break Runes before his attack continues. Reive's ability closely resembles that of Goldbrand, which he briefly wielded in the story. He is the secondary antagonist, and is encountered in multiple quests. Reive was formerly 2/5, but was changed to 3/5 because the old power rating made the card vulnerable to Execute. This page was last modified on 11 March 2019, at 03:52.